On July 4th, 1997 as Americans were stoking their barbecues, a NASA spacecraft touched down on Mars and bounced like a beach ball. The Pathfinder mission was an unlikely and stunning success that marked the beginning of a roaming robotic presence on the red planet. The successful feat surprised everyone—including the team behind the mission, a mission that didn’t have the best reputation in the beginning. NASA was trying something new: space travel for a bargain price. Pathfinder’s mantra was cheaper, faster, better. The goal was to cut down on red tape and dream of solutions no one had else had thought of. “Be crazy and bold and innovative,” says Pathfinder’s chief engineer Rob Manning. When Trosper arrived in Los Angeles, she joined a team of scrappy aerospace engineers at the Jet Propulsion Laboratory (JPL) willing to work on a lean budget and try something revolutionary. The airbags were designed to cushion Pathfinder’s landing. Touching down on Mars can be tricky because the atmosphere is so thin. That’s one reason no other country had had a successful landing for twenty years. NASA's last success was the Viking 1 and Viking 2 orbiter-lander in 1975. Manning says the team settled on a parachute to slow the spacecraft down as it hurtled through the Martian atmosphere. The engineers also wrapped the machine in a cocoon to protect it when it touched down on the rocky landscape—kind of like a beach ball. If successful, the tiny rover—about the size of a microwave—would become the first wheeled vehicle to explore the surface of another planet. NASA named it Sojourner. Seven months after the launch, NASA engineers monitored the spacecraft's status as it neared its icy destination. A nervous tension filled the control room at JPL. And then at the exact moment Pathfinder was expected to bounce down, a faint signal sounded, back on Earth. The room erupted with loud applause and cheering. “By late afternoon for us we were getting our first picture,” Manning says, smiling. 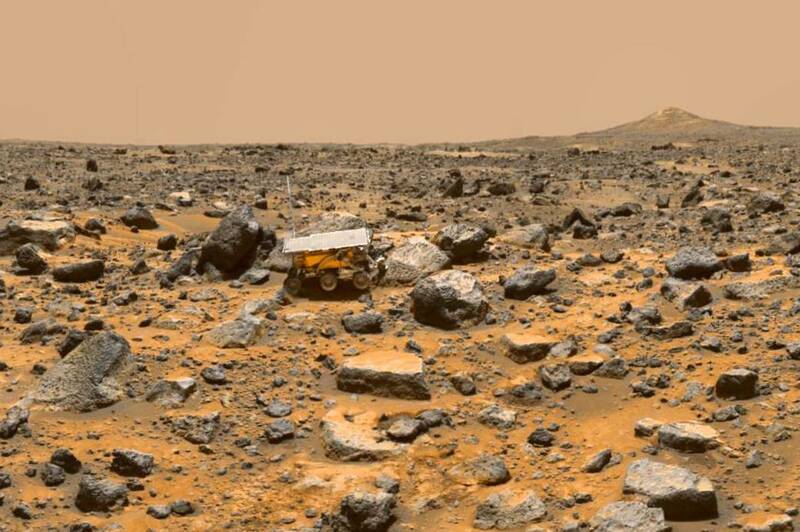 Miraculously, Pathfinder had traveled millions of miles and landed upright on the red planet. NASA uploaded the images to a new realm known as the World Wide Web. Jon Brooks, a science editor at KQED, remembers the moment vividly. The quest to find an answer has inspired three more NASA rovers after Pathfinder. The latest, Curiosity, is the size of an SUV and has been driving around Mars for nearly five years looking for clues about how and when the red planet went from warm and wet to cold and dry. Astronomers are still searching for signs of life, but they have confirmed the presence of water. Observations suggest that habitable lakes and streams likely existed in the ancient past. 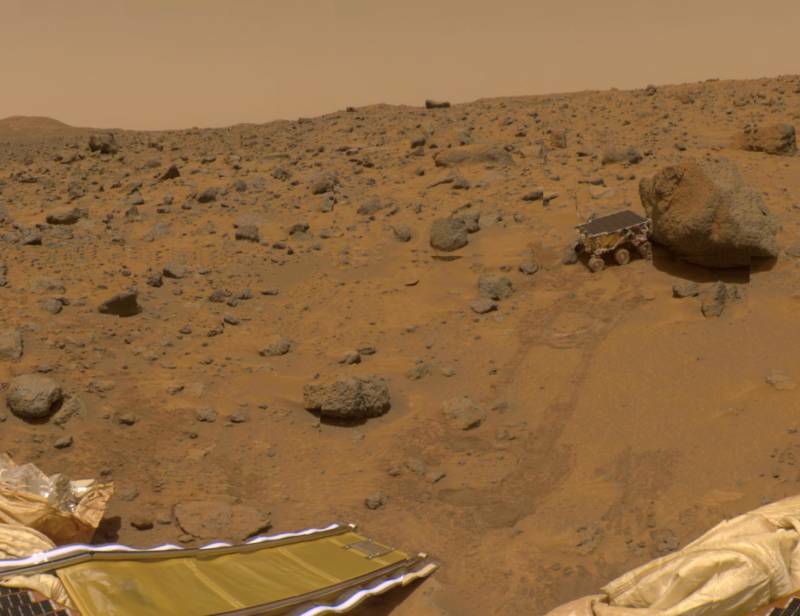 Mars is the only planet inhabited solely by robots (as far as we know). Next year the U.S. will send the InSight lander to Mars, and the Mars 2020 will follow. NASA hopes to land a human on the red planet within the next twenty years.